The room was not really a room. 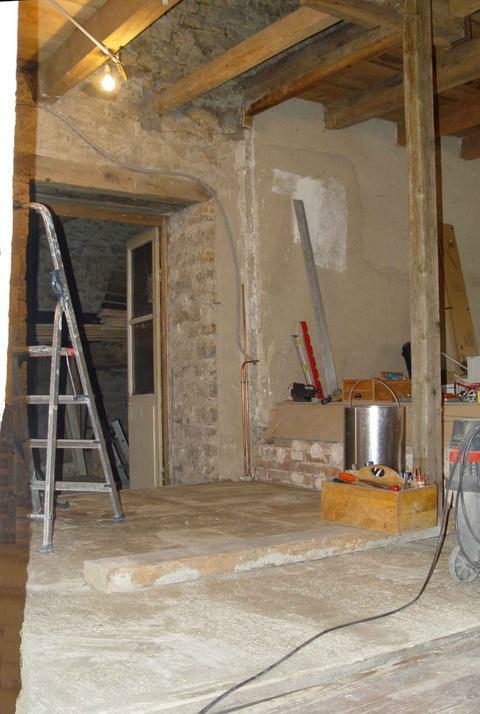 It was part of an immense couloir, with an exit to the adjacent barn. 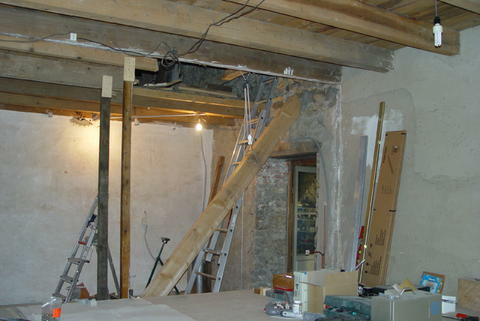 The ceiling was not complete, there was an opening from a former staircase. I put in a beam to close the ceiling. This is the fifth drawing I made. 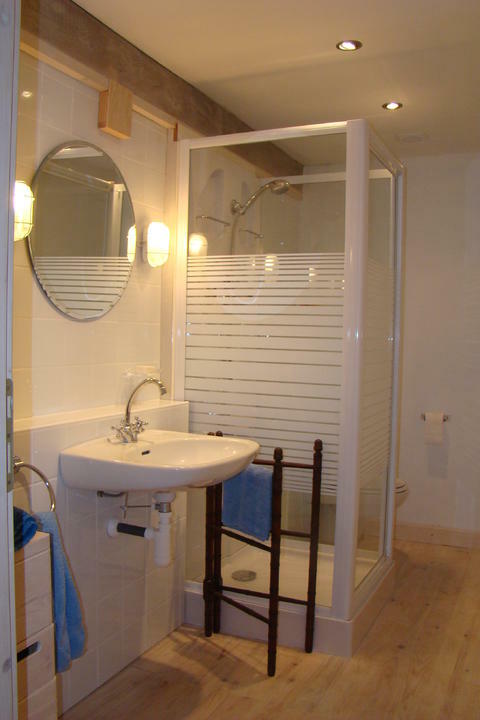 We wanted a full size bathtub, a shower (douche à l’Italienne), two sinks and a WC. The WC should, of course, be placed with the shortest possible connection to a new sewer which I had planned in the adjacent barn. 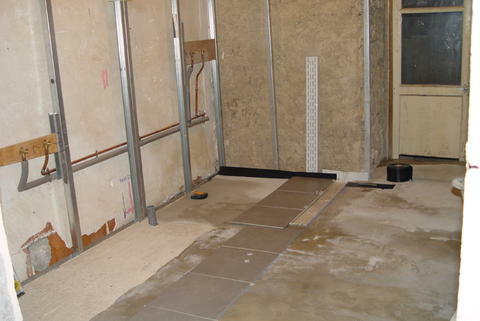 My first action was to remove the existing floorboards and to lay Lewis boards as a basis for a thin concrete floor. I succeded in making the floor not much higher than the original one. This was 32mm pine. 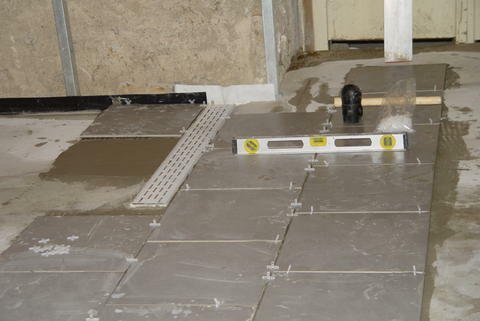 The ondulated board is 17mm, plus 8mm concrete, plus 10mm tiles+glue -> 35mm. 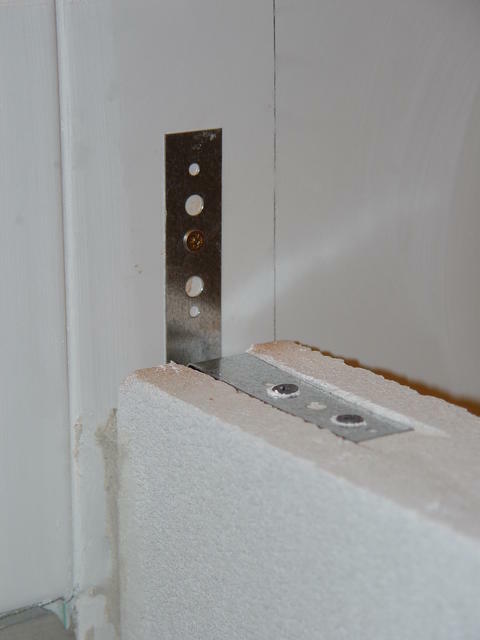 Then I placed the metal stud system for the plasterboards. I placed this ossature exactly square in a non-square room, see my drawing. 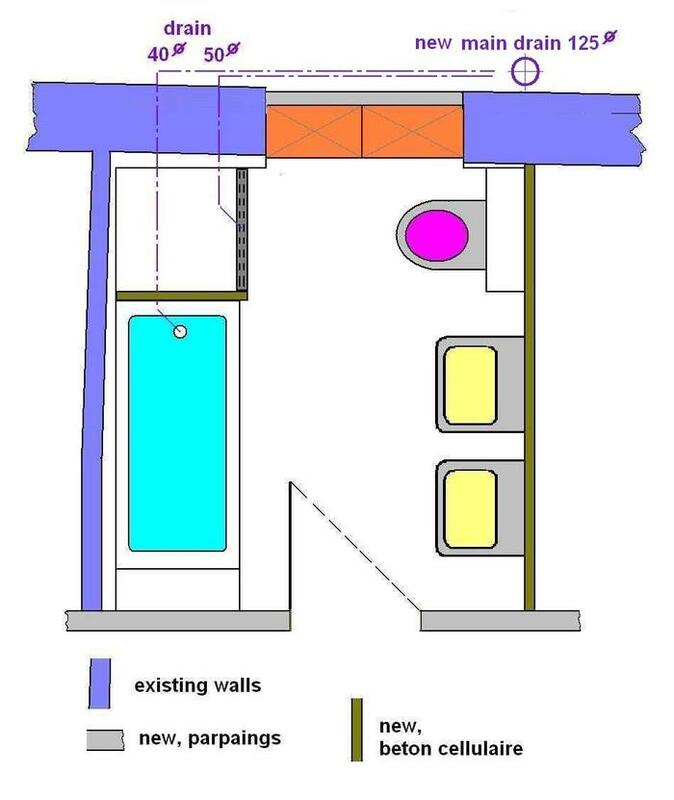 I had already planned separate drains for the bathtub and the shower to avoid the effect of communicating vessels. On the other side of the bathroom I laid the drains for the WC and the two sinks, and also the connections for a visitors bathroom (shower cabin, you see its tray provisionally placed, toilet and sink) which was the next project. With the floor laid I could install my plumbing. 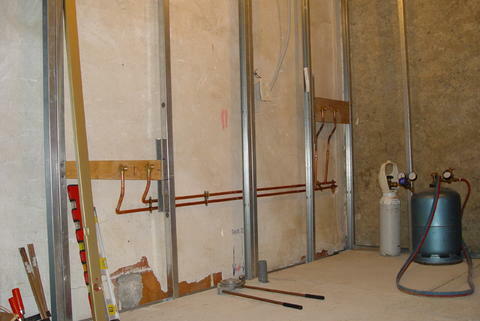 Here you see the connections for the bathtub (left) and the shower (right), all copper. 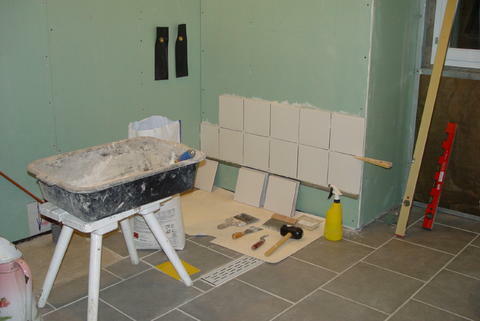 I tiled the floor with 33x33cm grey tiles, the walls with 20x20cm off-white tiles. 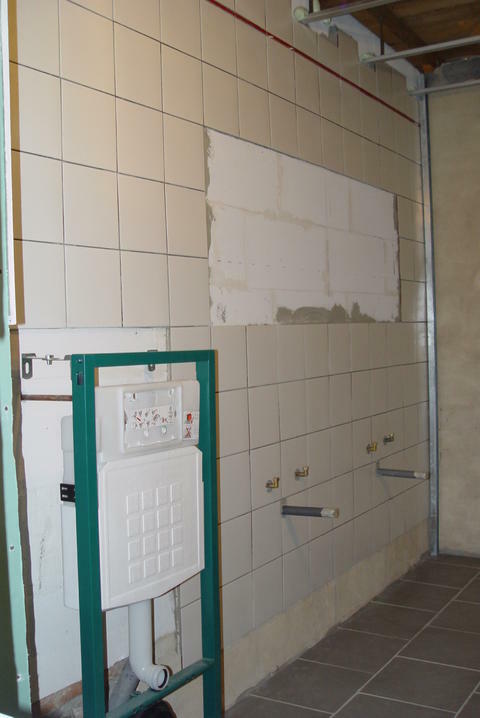 On the right side of the future shower you can see the white slab belonging to the line drain (this is placed under the tiles and up the wall) and the black sealing strip, also placed under the tiles; the portion you can see will then be placed between the green plasterboard an the wall tiling. Around the linear shower drain you’ll notice a somewhat strange tiling pattern. This is because I placed uncut tiles behind the linear drain – the strange small fill-in pieces will be hidden by the shower separation wall planned at the left side of the drain. 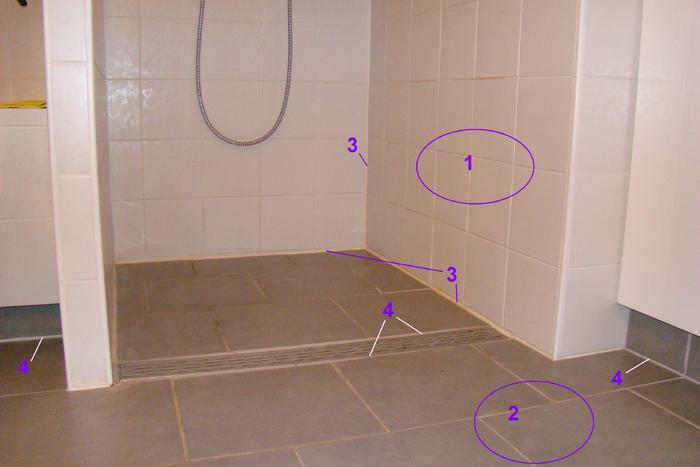 For shower floors an inclination of 0,5 -1% towards the drain is recommended, for my 90x100cm shower I’ve chosen 7mm, 0,7% thus. The next time I would opt for 1% . 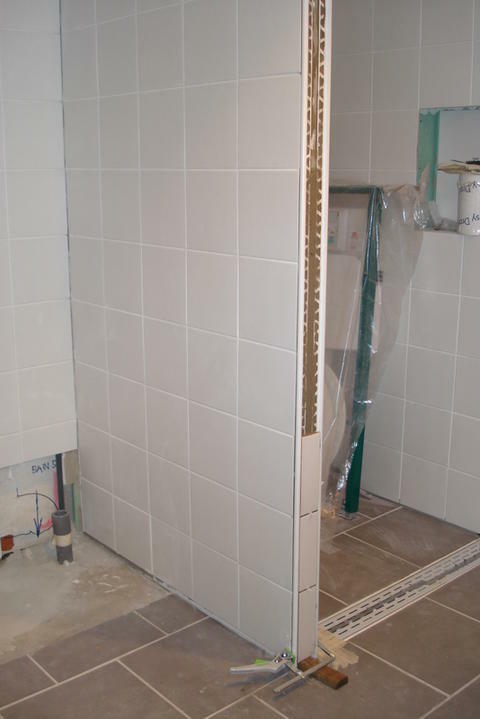 With the floor tiling completed I could start the wall tiling. 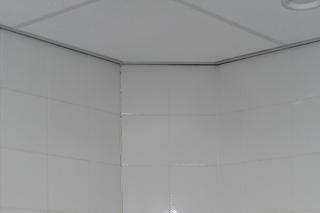 I left an area of 4 tiles wide and 4 tiles high untiled and placed the wood-and-plasterboard understructure for my recessed shelf, to comply exactly with the tile pattern. 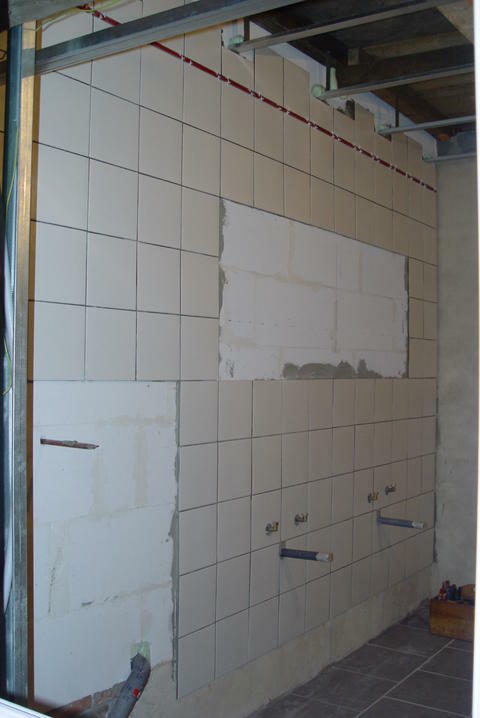 And I’ve also tiled the opposite wall, the separation from the visitors shower, built with beton cellulaire, where toilet and sinks will be placed. 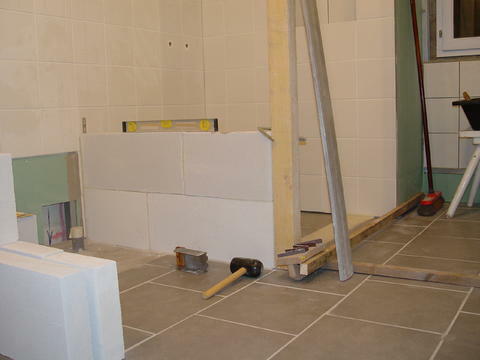 The 3 tiles high and 8 tiles wide area which is left untiled is for a made-to-measure mirror glued to the cellbeton wall. And now the shower separation! I built it from blocs de beton cellulaire, 25x60x7cm — other possibilities would have been glass bricks or a hardened glass screen. 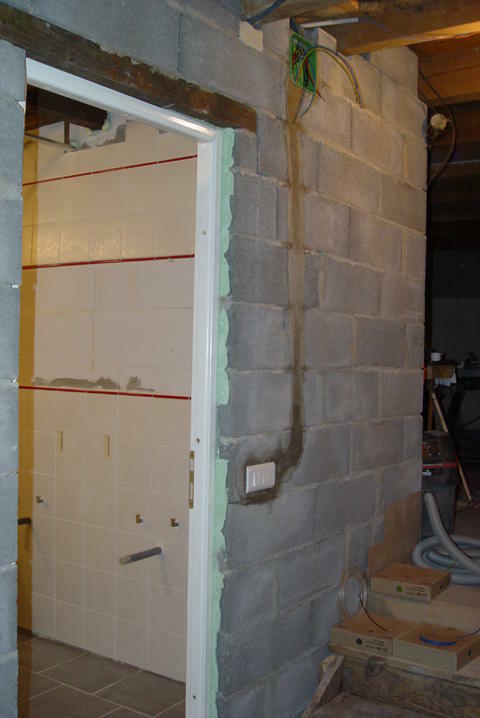 Every second layer of the blocks is connected to the rear wall by spring anchors. 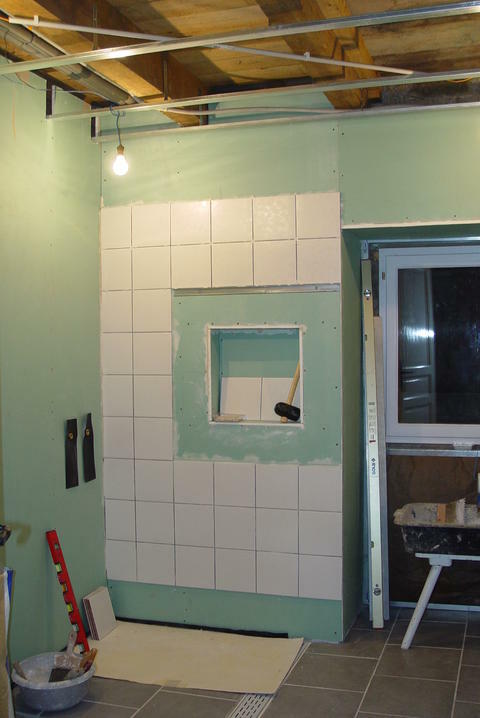 I then tiled the wall on both sides, for the front side I took plastic edge profiles and cut-to-measure tiles. 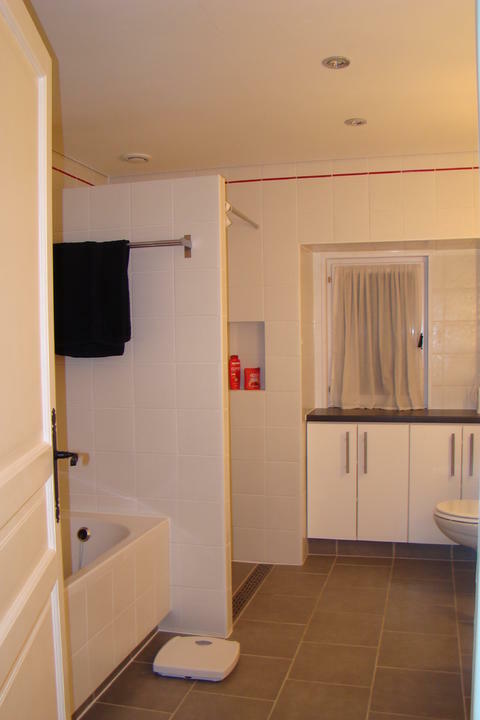 On the opposite wall I could now place the toilet. 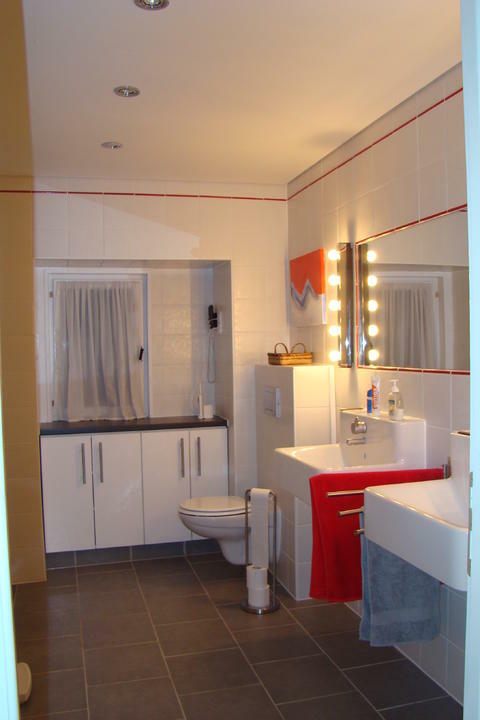 I’ve connected all electrics in an 175x175mm boite de derivation which I placed outside the bathroom: ceiling spots, mirrorside lighting, extractor fan, sockets for razor and toothbrushes, the wall-mounted hairdryer. I’ve placed a plastic bathtub. I built the surrounds from beton cellulaire on a recessed plinth, so you have some place for your feet when standing at the bathtub! We’re happy with the ensemble. 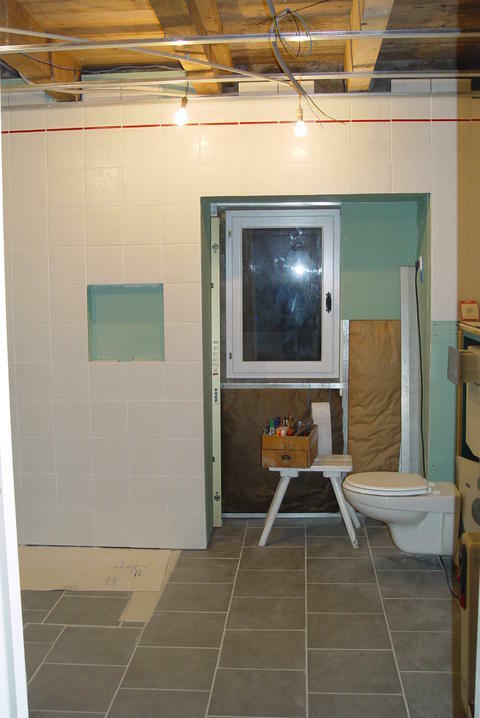 Then I built the adjacent visitors bathroom. 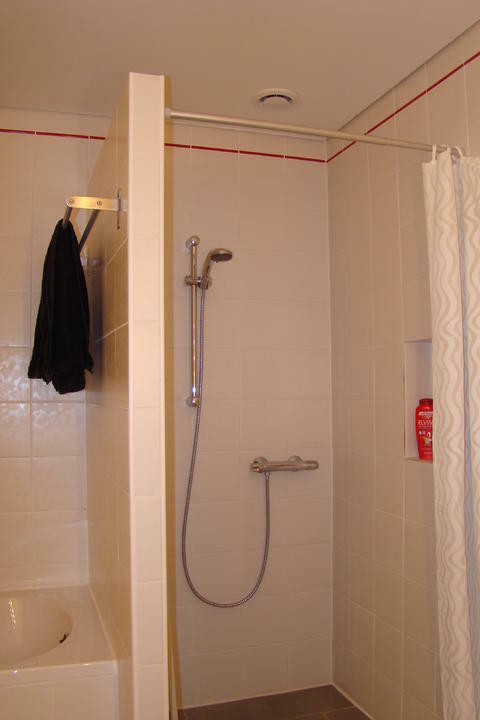 Toilet and sink placed, and now also the shower cabin. Extractor fan (hardly visible on the pics) in line with the ceiling spots, close to WC and shower, switched with the lights and equipped with a timer.. 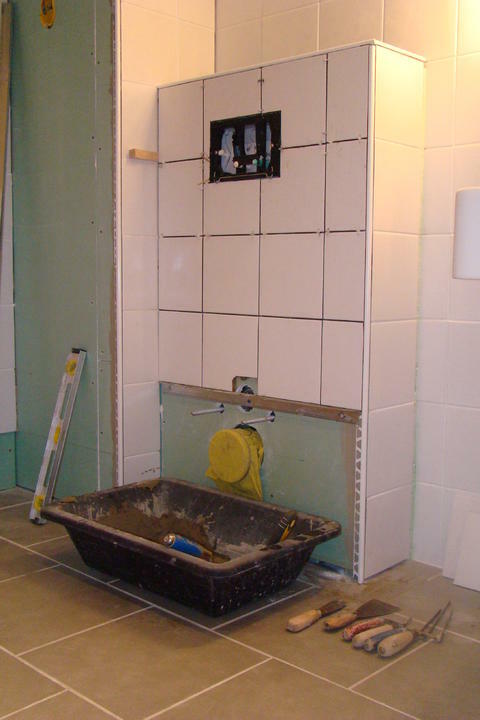 Some hints for tiling in an irreglar room can be found here. 10/10 from me. And that’s just for your explanation and description. The actual project is even better. Hear hear ! 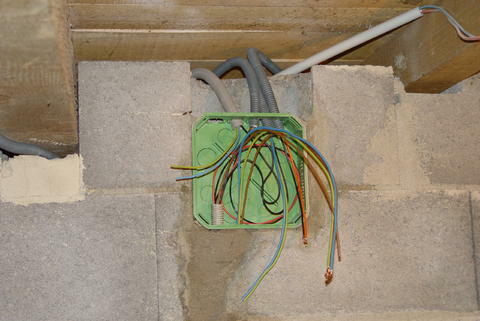 Well done, a lovely piece of advanced DIY. It looks fantastic! What an achievement! Sensational, well done. 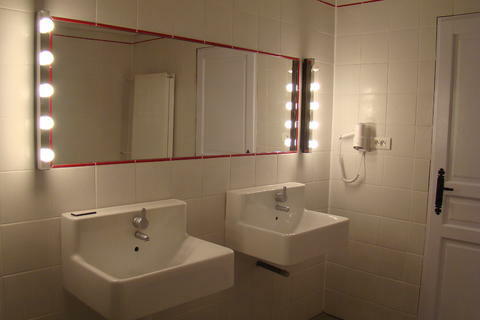 What is a couloir please and when is the bathroom warming party? Remember, you can't stop the waves, but you can learn to surf. It looks fantastic. Wish we could have found professionals here to come close to that sort of quality finish. Well done! 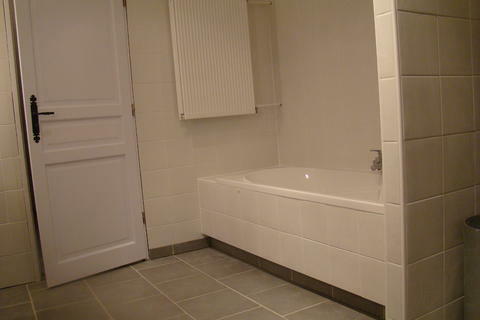 Very good, I like the idea of setting back the bath plinth and it matches well with the other plinths in the room. Never seen it done before but it looks so right, I wonder why I have never thought that all the others look wrong as they now will!! Sensational, well done. What is a couloir please and when is the bathroom warming party?Sledge. 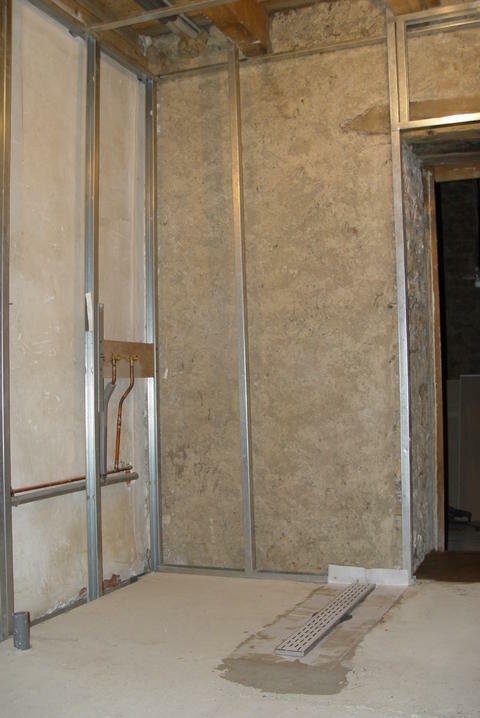 A domestic couloir is a more or less square corridor, giving acess to typically four or more rooms. I was asked this in a PM, but it may be of general interest. At places where walls and/or floor meet I prefer to seal tile joints elastically rather than with grout. 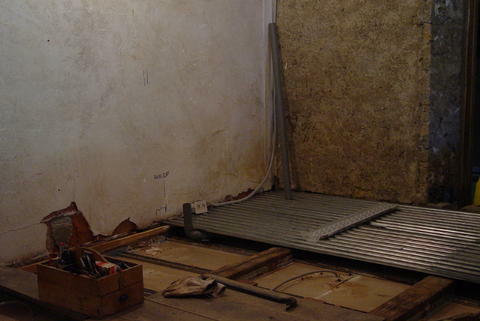 This is particularly necessary where walls or floors made from different base materials meet each other. The materials have different expansion coëfficients, they will therefore behave differently under temperature or moisture changes. This is generally accepted in the trade. Caulk is certainly prone to mould attack, but I find this a minor risk compared with the chance of moisture attack if a grout joint cracks. 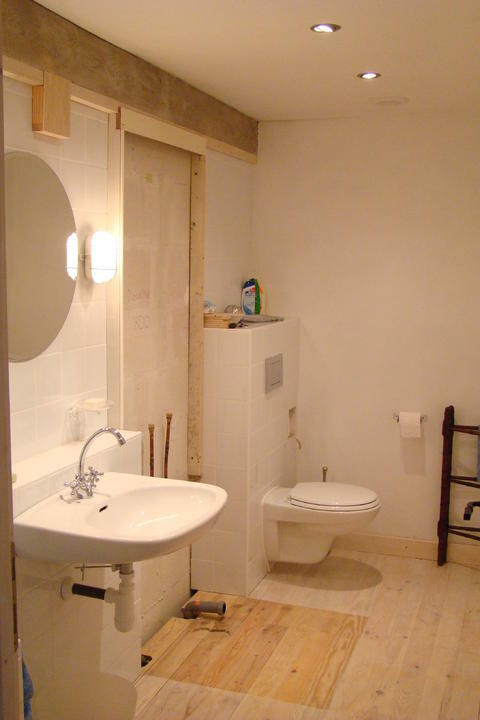 This photograph was taken to-day; the bathroom is 8 years old. 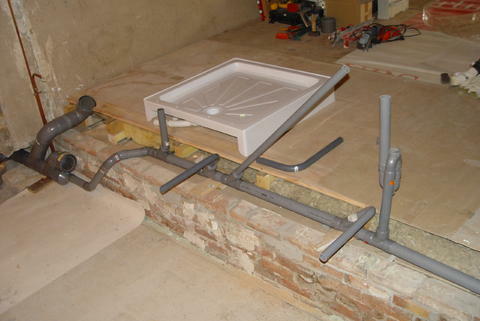 No leaks, no mould. 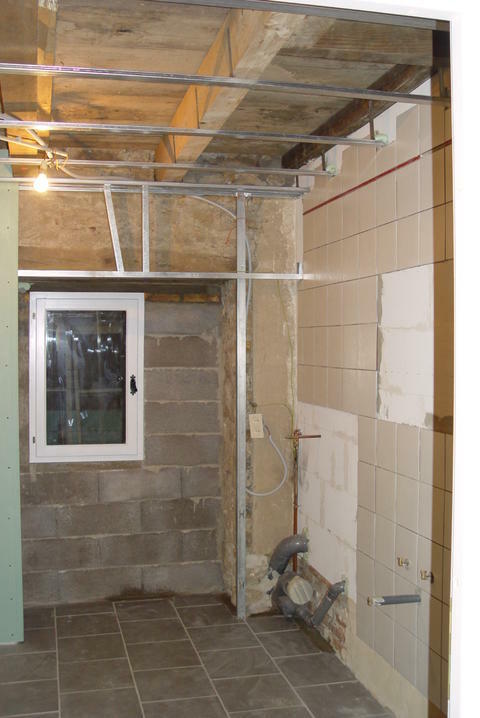 The walls are bricks, a downpipe in the corner was covered with plaster board, and the whole tiled with grout joints. After three months the left joint cracked. 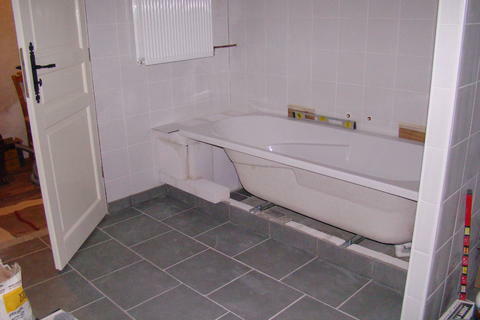 I like the idea of setting back the bath plinth and it matches well with the other plinths in the room. Never seen it done before but it looks so right!! I saw this 25 years ago in a chalet in Switzerland where we were skiing. 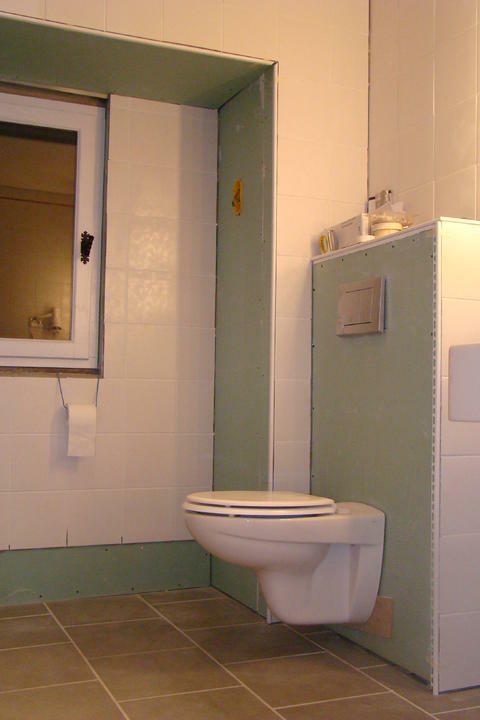 It looked so simple, and was so practical, that I kept the idea in my mind until I had to build a bathroom myself. Certain things are so simple. Location: West Sussex and 17. Looks good Chris and attention to detail is excellent. I have to admit you must be one of the tidiest workers I’ve ever seen – I wish I was as organised and tidy doing DIY. Thanks for the detailed photos and explanations of the job Chris. Excellent work and heartening to know it is still all working fine some years later without any problems. As I get closer to starting the downstairs installation and also the upstairs bathroom bit I will be asking various questions regarding the right French names for stuff. I notice you have used copper piping, have you any aversion to the plastic (in gain stuff) or is it a case of using what you had and what you know? I ask as I am intending to run (already have in some areas) the plastic pipe in various sizes from my distribution manifold (by the thermal store) to sinks showers bath etc.